One of the best ways to attract people to your construction company is through Google’s many features. Google has positioned itself as one of the most well known search engines in the world. According to InternetLiveStats.com, Google processes over 40,000 search queries every second. If you want to get search engine traffic, focusing most of your efforts on Google is the way to go. It’s not hard getting listed on Google, and we have the best tricks you can use to get listed there fast. Your chances of being listed on Google will increase significantly if you have your own website with the domain containing ‘construction’ and your hometown somewhere in it. When a search is performed on Google with those keywords, your website will show up eventually. Also, having a website gives you more opportunity to reach and interact with your customers, potential clients, and other people in your online community. Your first step should be making sure your construction company is listed on Google Maps. 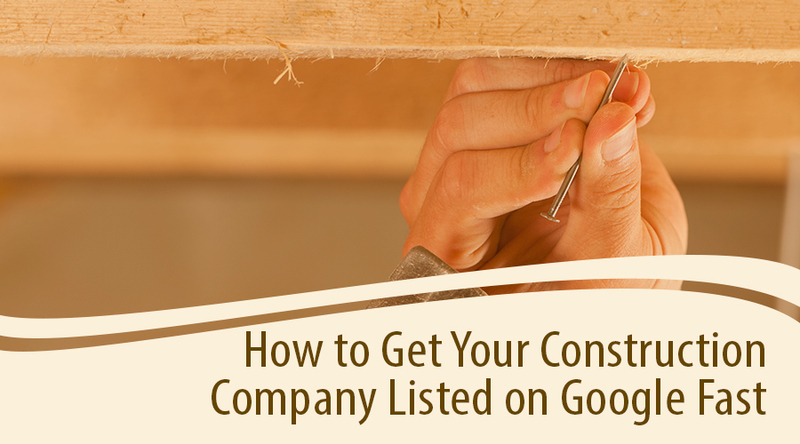 Find out if you’re already listed by doing a search for ‘Construction Companies’ and your town. If you don’t see your construction company listed anywhere, setting up a marker on Google Maps for your construction company will help you attract more clients. Start on Google’s My Business page and follow the steps there to set up your business page. Once your business page is set up, there are a few things you can do to optimize your page to further attract new members such as making special offers, filling out description details such as hours and parking information, as well as responding to customer reviews. Remember, this is where new people will first meet your business, so make sure your business is well represented. It’s very important to look good and high quality backlinks make you look really good. If you own other sites or have friends who own other sites, offer to do a link trade. Have them include your site on their website with a link to your site and vice versa. The more sites linking to your site the more credible you look to Google’s search engine criteria. If you’re not blogging already, now’s the time to start. Don’t just blog about anything. Make sure your content matches what people in your area will be searching for such as construction tips, hiring a contractor, etc + your city. Blog about current projects you’re working on, new construction going on in various areas of your local area, DIY construction tips and successes from your work with past clients. The more you can focus on blogging about local topics related to construction, the better as people looking for construction companies will inevitably search for construction companies in their city. You should blog consistently at least twice a week in order to catch Google’s search engine attention. Let Google know that your site is online by submitting your URL. It’s not guaranteed that you’ll be added nor can you determine when your site will be added but generally this step will help get your site listed if there are no other issues detected by Google’s search bots. This takes a little time and money, but a Google AdWords campaign will definitely put your construction company on the first page of Google search results. You can advertise against certain keywords that will ensure people searching for those keywords will see your construction company. This is a super effective way to get listed on Google really fast. The internet offers a wide range of opportunities to advertise your business. Being listed on Google is one of the easiest ways to attract new clients to your construction company. Plus, most of these strategies are free! If you’re looking for help or more in-depth marketing, take advantage of our tactics and Construction Company Marketing services to give your business even more exposure on Google.